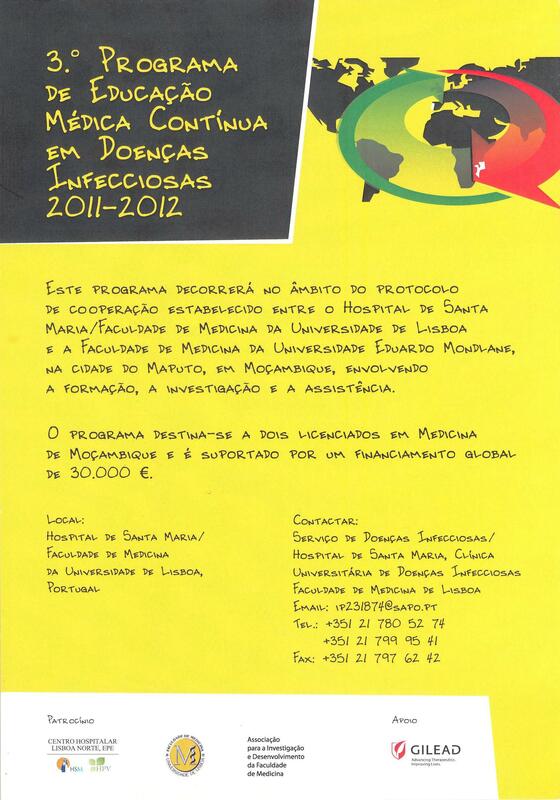 – Fourth Updating Course on Tuberculosis and AIDS, from 26 to 29.07.2011 (Faculty of Medicine of Lisbon /Faculty of Medicine of the Eduardo Mondlane University), Maputo – Mozambique. – Tutorial Clinical Internship in Tropical Medicine, one month long, for 12 students of the Faculty of Medicine of the University of Lisbon at the Dr. Agostinho Neto (Cape Verde), Ayres de Menezes (São Tomé and Príncipe) and Central of Maputo (Mozambique) hospitals. Being an island whose territory is slightly larger than Madeira, São Tomé and Príncipe, according to data from the World Health Organization, is still a country with high infant morality rate and which bears a considerable burden in terms of infectious diseases and nutritional deficiencies as causes of death. The Central Hospital of São Tomé stands out as a reference in addressing diseases and for its work towards improving health care and the living conditions of the population. The hospital is located in the capital and main city of the country, and the authorities have named it Dr. Ayres de Menezes (1889-1946), who was a prominent figure in the political, social, and cultural history of São Tomé. Despite difficulties, Dr. Ayres de Menezes Hospital has recently been developing with regard to infrastructures, and has benefitted from basic financial support and from the work of foreign medical teams, namely Portuguese, but also from Cuba and other countries. Ayres de Menezes came from particularly humble origins. Despite this fact, his uncle was able to send him to Lisbon, where he continued his studies at the Faculty of Medicine and became a colleague of Dr. Pulido Valente, graduating thanks to the financial support of his friend Henrique de Mendonça. Expeditionary of the Portuguese Army in the 1914-1918 War as a lieutenant physician, he died in Angola in 1946, aged 57, where he was a doctor of the Board of Health.